Thursday 20 June, 8:30 am-3:45 pm, visiting speaker and panelist presentations. Massive Open Online Courses (MOOCs) were ‘invented’ in Canada in 2008, and then became transformed, institutionalized and scaled up via the efforts of people, universities, and firms, in the Boston and San Francisco Bay Area city-regions. In the process debates about MOOCs have blossomed, entangled as they are in discussions about online pedagogy through to longer-standing debates about lifelong learning, internationalization, austerity, ‘disruptive innovation,’ public service, deterritorialization, education reform, and many (many) other issues. The European MOOCs in Global Context Workshop, a free and open access (i.e. 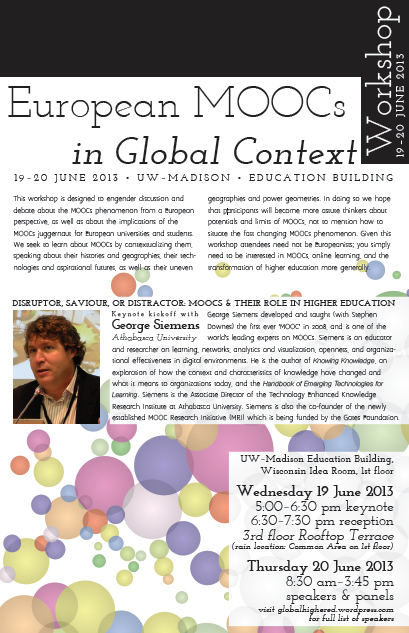 no RSVP) event will be held in the Wisconsin Idea Room, Education Building, at the University of Wisconsin-Madison from 19-20 June 2013, This workshop is designed to engender discussion and debate about the MOOCs phenomenon from a European perspective, as well as about the implications of the MOOCs juggernaut for European universities and students. We seek to learn about MOOCs by contextualizing them, speaking about their histories and geographies, their technologies and aspirational futures, as well as their uneven geographies and power geometries. In doing so we hope that participants will become more astute thinkers about potentials and limits of MOOCs, not to mention how to situate the fast changing MOOCs phenomenon. Given this workshop attendees need not be Europeanists; you simply need to be interested in MOOCs, online learning, and the transformation of higher education more generally. The workshop kicks off with a 5:00 pm keynote talk on Wednesday 19 June by George Siemens (Athabasca University, Canada). 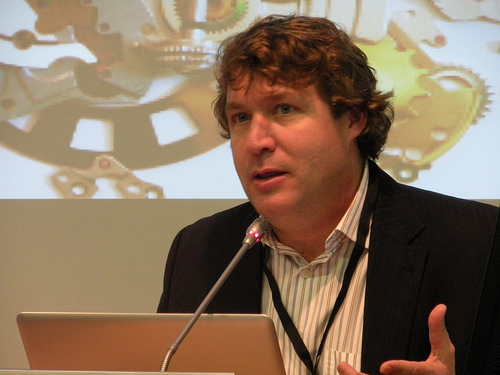 George Siemens developed and taught (with Stephen Downes) the first ever ‘MOOC’ in 2008, and is one of the world’s leading experts on MOOCs. Siemens is an educator and researcher on learning, networks, analytics and visualization, openness, and organizational effectiveness in digital environments. He is the author of Knowing Knowledge, an exploration of how the context and characteristics of knowledge have changed and what it means to organizations today, and the Handbook of Emerging Technologies for Learning. Knowing Knowledge has been translated into Mandarin, Spanish, Persian, and Hungarian. Siemens is the Associate Director of the Technology Enhanced Knowledge Research Institute at Athabasca University, leading the learning analytics research team. Previously, he was the Associate Director, Research and Development, with the Learning Technologies Centre at University of Manitoba. Siemens is also the co-founder of the newly established MOOC Research Initiative (MRI) which is being funded by the Gates Foundation. The title of Siemens’ keynote talk at UW-Madison is ‘Disruptor, Saviour, or Distractor: MOOCs and their role in higher education.’ An open reception on the Education Building’s rooftop terrace will follow. Roger Dale (University of Bristol, UK). Roger Dale is Professor of Education. Until 2002, he was Professor of Education at the University of Auckland. Prior to moving to Auckland, he had been involved in producing courses in sociology of education and education policy at the UK’s Open University for almost 20 years. He conducts research on the EU and education policy, complementing and extending qualitatively his earlier work on the state and education policy. He was Scientific Coordinator of the EU’s Network of Experts on Social Science and Education (NESSE), and Academic Coordinator of the EU Erasmus Thematic Network, GENIE (Globalisation and Europeanisation in Education) which was based in the University of Bristol’s Centre for Research on Globalisation, Education and Societies. Pierre Dillenbourg (École Polytechnique Fédérale de Lausanne, EPFL, Switzerland). Pierre Dillenbourg is academic director of EPFL’s Center for Digital Education and head of the Computer-Human Interaction for Learning & Instruction Lab. He is lead organizer of EPFL’s European MOOC Summit (6-7 June 2013; see slides below), and one of the world’s leading thinkers about the nature of MOOCs and learning analytics. He started his research on learning technologies in 1984, and conducts research on MOOCs, computer-supported collaborative learning & work, learning technologies, and human-computer interaction. Michael Gaebel (European University Association, EUA, Belgium). Michael Gaebel is the Head of the Higher Education Policy Unit, which focuses on the Bologna Process, lifelong learning, internationalisation and global dialogue. When he first joined the EUA in 2006, he was in charge of developing EUA’s international strategy and global exchange and cooperation. Mr. Gaebel is in charge of the EUA’s task force on MOOCs. The EUA represents and supports over 860 higher education institutions in 47 countries, providing them with a unique forum to cooperate and keep abreast of the latest trends in higher education and research policies. Fernando M Galán Palomares (European Students’ Union, ESU, Belgium). Mr. Galán Palomares is incoming Vice-Chair of the ESU Executive Committee with responsibilities including quality assurance. The European Students’ Union (ESU) is the umbrella organisation of 47 National Unions of Students (NUS) from 39 countries. The aim of ESU is to represent and promote the educational, social, economic and cultural interests of students at the European level towards all relevant bodies and in particular the European Union, Bologna Follow Up Group, Council of Europe and UNESCO. Through its members, ESU represents over 15 million students in Europe. It is also worth noting that the ESU adopted a new policy about MOOCs in their last General Assembly. Mark Johnson (University of Wisconsin-Madison, USA). Mark S. Johnson is Assistant Professor of Educational Policy Studies at the University of Wisconsin-Madison, and was previously associate professor of history and education at Colorado College. His research and teaching interests focus on education in Russia and Central Eurasia, especially post-Soviet higher education; and comparative studies of soft power and public diplomacy programs. He has worked as a consultant and evaluator for organizations including the U.S. Department of State, the National Endowment for Democracy, the National Bureau of Asian Research, the Open Society Institute, the Ford Foundation, the Carnegie Corporation of New York, the American Council of Learned Societies, the Civilian Research and Development Foundation, the World Bank, the National Research University HigherSchool of Economics in Russia, and Nazarbayev University in Kazakhstan. Linda Jorn (University of Wisconsin-Madison, USA). Linda Jorn serves as Associate Vice Provost of Learning Technologies and Division of Information Technology (DoIT) Director of Academic Technology (AT) at the University of Wisconsin-Madison. She currently leads a team of 80 academic technology professionals that provide a suite of 22 services to campus; several AT team members co-lead, with other campus partners, the campus-wide MOOC pilot. She is passionate about designing academic technology services and developing key partnerships that take a scholarly approach to advancing learning and research through the innovative and thoughtful use of technology. In her day-to-day work, she draws on her academic and work background in curriculum and instruction, rhetoric, communication, nursing, qualitative research, and leadership. Linda regularly serves on review committees for national learning technology grants and advisory boards for national and regional organizations. Pang Wei Koh (Coursera, USA). Pang Wei Koh is Head of Course Operations at Coursera, where he oversees the design, implementation, and support of all online classes on the Coursera platform, and works with faculty and staff from nearly 80 partner institutions to push the envelope in digital pedagogy. Before joining Coursera, Pang Wei worked on computational biology and machine learning in the Stanford Artificial Intelligence Lab with Professors Andrew Ng and Daphne Koller, Coursera’s co-founders; his work on computational cancer morphology was recently recognized by several awards, including the Ernest Walton Medal for Computer Science, awarded by the President of Ireland. Antonio de Lecea (Delegation of the European Union to the United States). Antonio de Lecea is Minister and Principal Advisor for Economic and Financial Affairs Delegation of the European Union to the United States. Prior to joining the Delegation, Dr. de Lecea served as the Director for International Affairs in the European Commission’s Directorate General for Economic and Financial Affairs, steering analytical and policy support for the Commission’s economic relations with non-EU countries and multilateral and regional economic institutions including the IMF, the World Bank, the G-20, the G7/G8, and the OECD. From 1999 to 2004, Dr. de Lecea was the economic advisor to then-European Commission President Romano Prodi. 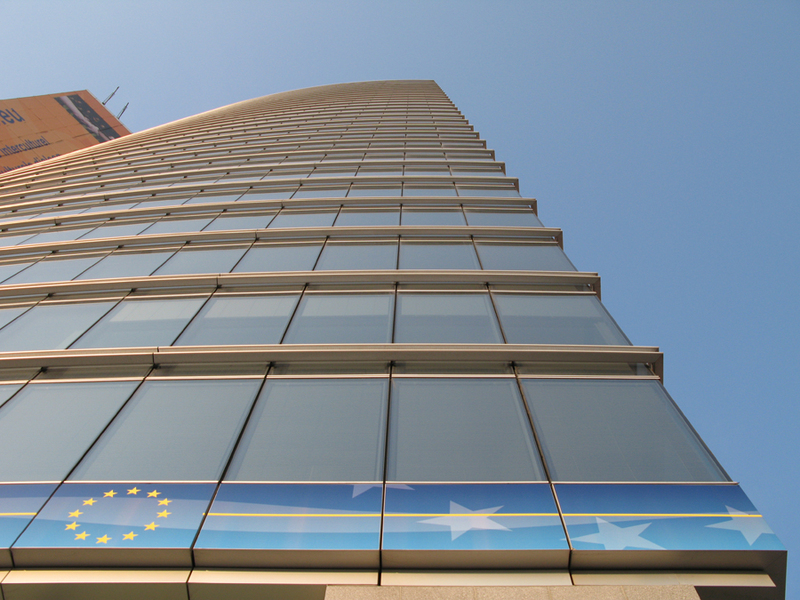 Before joining the European Commission, Dr. de Lecea served in the private office of the Spanish Secretary of State for Finance in Madrid and in academia (at Basque Country University (UPV), in Bilbao, Spain). Barbara McFadden Allen (Committee on Institutional Cooperation, USA). Barbara McFadden Allen is Executive Director of the CIC (a consortium made up of members of the Big Ten Athletic Conference and the University of Chicago). She is responsible for the overall conduct of the CIC headquarters’ staff and programs, and works with the Members (chief academic officers) to define and implement the consortium’s mission and agenda. CIC universities co-own and operate a multi-million dollar fiber optic network; have partnered with Google to digitize our university libraries; and develop and coordinate innovative academic & research collaborations. Howard Lurie (EdX, USA). Howard Lurie is Vice President of External Affairs, EdX. He has taught and designed online courses and managed digital content collections for internationally known educational non-profits, including Facing History and Ourselves. These experiences leveraged a 15-year teaching career, during which Howard taught history and digital humanities. Prior to joining edX, Howard served as the Managing Director for PBS LearningMedia, a nationally recognized digital learning platform produced by the Public Broadcasting System, and also served as the Associate Director for Education at the WGBH Educational Foundation in Boston, Mass. Mr. Lurie will be speaking via Skype on Thursday morning. Kris Olds (University of Wisconsin-Madison, USA). Kris Olds is Professor and Chairperson of the Department of Geography, UW-Madison. Olds’ research focuses on the globalization of the services industries (including higher education, architecture, property) and their relationship to urban and regional change. He has played a variety of strategic service roles for UW-Madison, as well as for organizations including the OECD, NAFSA, the Association of Universities and Colleges of Canada, the International Association of Universities, and the Association of Commonwealth Universities. He is currently developing a MOOC (Globalizing Higher Education and Research for the ‘Knowledge Economy’) with Susan Robertson (University of Bristol). Susan L. Robertson (University of Bristol, UK). Susan Robertson is Professor, Sociology of Education, Graduate School of Education, University of Bristol. She is also Director of the University of Bristol’s Centre for Globalisation, Education and Societies, and co-editor of the journal Globalisation, Societies and Education. Robertson’s research focuses on the political economy of the education sector, and how education is the object and outcome of converging and diverging policies and practices around the globe. These include creating education as a services sector, the commercialisation of education, and the increased role of for-profit actors in the sector. An important aspect of this transformation has been the growth of international agencies and transnational firms in shaping these processes. She is currently developing a MOOC (Globalizing Higher Education and Research for the ‘Knowledge Economy’) with Kris Olds of the University of Wisconsin-Madison. UW-Madison Sponsors: European Union Center of Excellence with additional support via Education Innovation, Division of Continuing Studies, Division of Information Technology, Office of the Vice Provost for Teaching and Learning, Wisconsin Center for the Advancement of Postsecondary Education, Department of Geography. Further Information: Please note that this is an open and free event – all are welcome, regardless of your affiliation, and there is no need to sign up as an attendee. 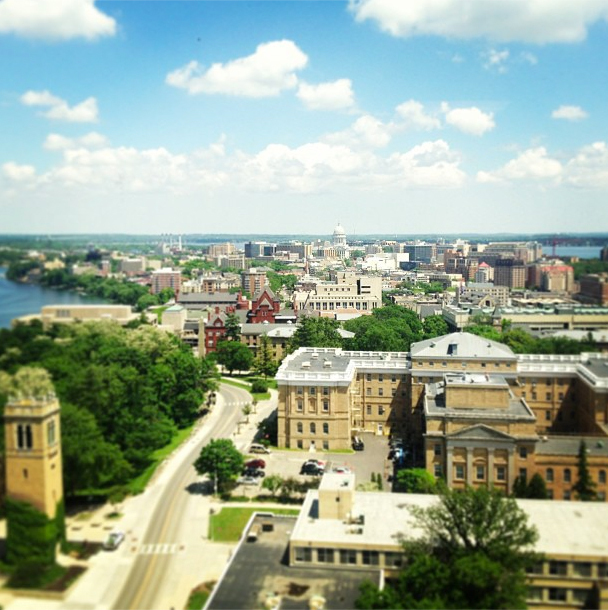 All sessions, apart from the 19 June reception, will happen in the Wisconsin Idea Room, Education Building, at the University of Wisconsin-Madison. Note: The slides below were presented at EPFL’s European MOOC Summit (6-7 June 2013) and are worth perusing before our workshop.